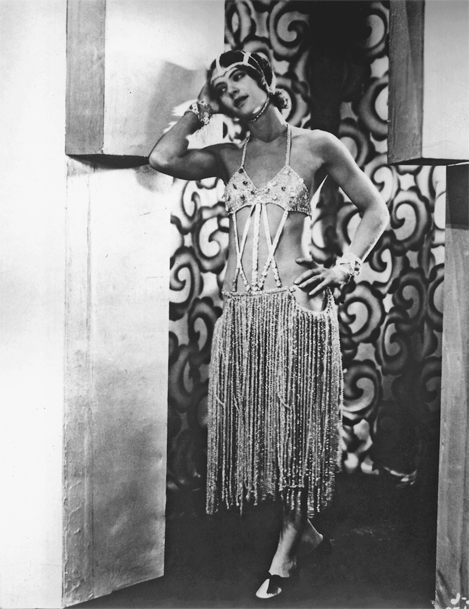 Black and Tan (1929), also known as Black and Tan Fantasy, is a short film directed and written by Dudley Murphy and features Duke Ellington and His Orchestra. The film was recorded in the RCA Photophone sound-on-film system and originally released by RKO Radio Pictures on 8 December 1929. 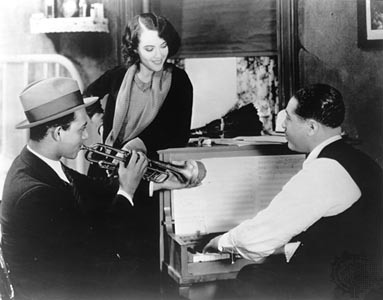 In the film, Duke Ellington and His Orchestra play the Ellington tunes “Black and Tan Fantasy”, “Black Beauty”, “The Duke Steps Out”, and “Cotton Club Stomp” (uncredited). The short starts with Ellington and trumpeter Arthur Whetsel playing a famous early Ellington number, The Black and Tan Fantasy, which Ellington co-wrote with trumpeter Bubber Miley. Ellington always cited Miley as one of the musicians who taught him about the ability of music to express human passion (the other was Sidney Bechet), and the number seems to have had a particular significance for Ellington, for he recorded it over and over again. 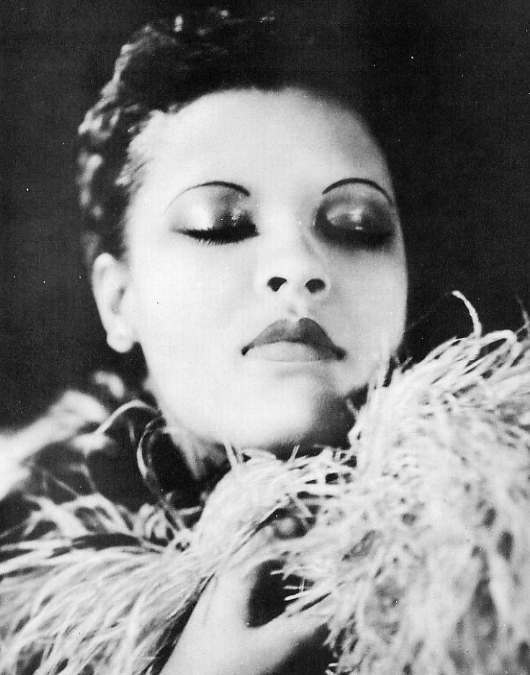 Black and Tan also contains “dancing” by Fredi Washington and a number of other Cotton Club dancing girls. Incomplete; the full film is 19 minutes long, according to IMDb. 1930 – Old Man Blues (Duke Ellington, Irving Mills) – from the Amos and Andy film Check and Double Check. 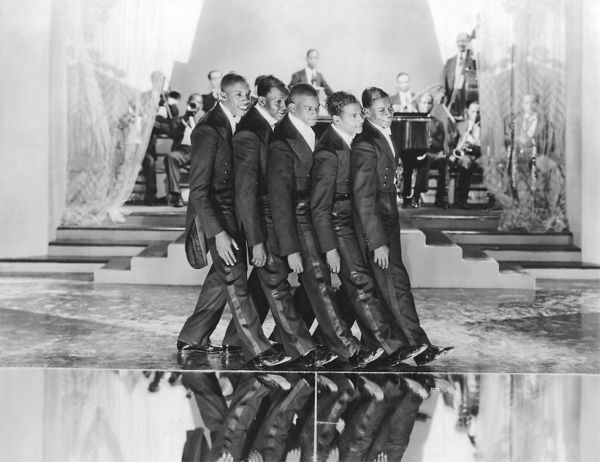 Ellington and His Cotton Club Band actually perform on three songs in the film but this clip has only small portions of two of them, including a few bars of the Rhythm Boys singing Three Little Words. Old Man Blues appears to be complete. A Bundle of Blues. 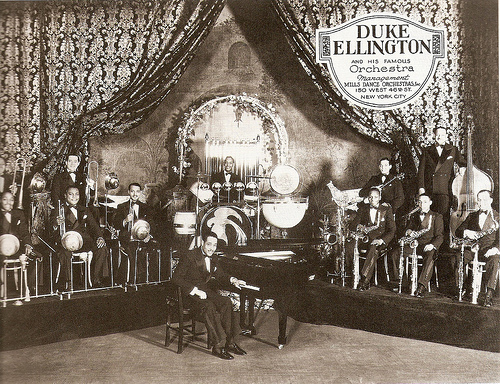 A short film by Paramount Pictures featuring Duke Ellington and his Orchestra performing five songs. For some reason the list of songs as given at IMDb (bulleted list below) is not in the order as performed in the film. In fact, I’m not certain that all of the songs listed are played. There are three major numbers performed, in this order. Note, 4 February 2012, regarding Rockin’ in Rhythm: I rewatched the film today and found it disconcerting to see Ellington pounding on the keys at about the one minute point, repeatedly driving his left hand down from about a foot above the keyboard, and yet hearing not a single note from the piano. Same goes for the guy flailing away on the rhythm guitar in the center of the following shot. IMDb lists two others, Lightnin’ and the title song, both supposedly written by Duke Ellington and played by Duke Ellington and his Orchestra in this short. I don’t know the song Lightnin’ , but it may be the fast piece that is played during the credits. Or maybe that’s Bundle of Blues. Either way, IMDB seems to report a phantom song. Of the two videos below, the first is approximately the correct length of the complete short film; the second is 24 seconds shorter than the first.